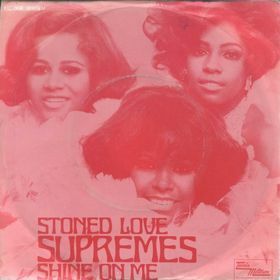 “Stoned Love” was the Supremes’ biggest hit of the post-Diana Ross era, and with good reason – it sounds like a throwback to the golden Holland-Dozier-Holland age of Motown. Motown producer Frank Wilson discovered the song when it was played over Detroit radio during a talent search contest. Amazed to find such a mature work had been penned by a local teenager, Wilson worked with Kenny Thomas, the young writer, and arranger David DePitte before presenting the number to Berry Gordy and the Supremes. In a narrative repeated so frequently it has nearly become a cliché, Gordy hated the song. The reason for Gordy’s dislike is unclear, but there was concern over the title. Thomas and Wilson insisted the title referred to love with a solid foundation, not drug use. The original title, “Stone Love” supports this claim. Somehow the single was mislabeled “Stoned Love” at the pressing plant and the new title stuck. Just as they had three years ago when the Doors sang “we couldn’t get much higher” on the Ed Sullivan Show, CBS freaked out over the potential reference and cut the song from the girls’ appearance on the Merv Griffin Show. The hope-filled lyrics brim with the optimism of youth and could easily turn into treacle. Thomas and DePitte turned them into a great showcase for Jean Terrell’s talents. All elements seem to feed off her emotion, particularly the inspired backing vocals of fellow Supremes Mary Wilson and Cindy Birdsong. Wilson and Birdsong had been banished from the final recording sessions with Ross and they seem extra happy to be operating as a group again. From the propulsive snare driving the song, down to the swirling strings and display of voices, the arrangement recalls the Supreme’s finest moments with the Holland-Dozier-Holland team. Fans seemed to agree, sending the song to the top of the R&B chart an into the pop Top 10. Again, Gordy’s steadfast, initial instinct had been proven wrong. ONE OF MY FAVORITE SONGS FROM THE TALENTED TRIO WITH THE FABULOUS JEAN TERRELL AT THE HELM. THEY KNOCKED OUT THE BALL PARK AND ALSO PROVED MANY OF THEIR CRITICS WHO BELIEVED THAT W/OUT DIANA ROSS OUT FRONT AS LEAD SINGER THIS WOULD SURELY BE THE DEMISE OF THE LADIES – U GO MARY CINDY & JEAN! Thanks for reading, Charmain. I couldn’t agree more. It’s hard to imagine Diana Ross singing with the depth and range Terrell shows.